Are you from NYC and looking to make some cash for diamonds? Before you dig through your jewelry box looking for some old diamonds to make a quick buck, here are a few basics you should grasp before going through NYC looking for a diamond buyer so as not to get ripped off as you make cash for diamonds. These are the basic criteria that all jewelers use to grade diamonds. This might be the most important part of all diamonds. First of all, don't confuse the cut with the shape of the diamond. The shape is the general appearance of the diamond -- Round, princess, opal, etc. The cut is actually the diamonds reflective qualities. A good cut results in a bright and brilliant diamond. A diamond's angles and finish is what determines how light is reflected off of it giving it that mesmerizing quality; definitely an important factor when shooting for the most cash for diamonds. 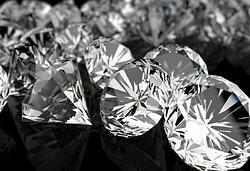 The most valuable diamonds are those that are colorless. The closer to colorless a diamond is the more light can pass through giving the diamond a more sparkly appearance. Only very few diamonds are truly colorless so a diamond's color is gauged in how close to colorless they are. This relates to the visible blemishes and flaws on the diamond. There are two kinds of flaws jewelers look for -- blemishes and inclusions. The former usually includes scratches or chips whereas the latter, inclusions, include air bubbles, cracks, or other minerals mixed in with the diamond. Carats weight is the unit of weight used for measuring diamonds. It's a common fact that large diamonds are considerably rarer than small ones, thus explaining the exponential rise in price in relation to its size. A single carat is equal to 200 milligrams. Carat weight is different from karat, which is used to measure the purity of gold. The kind of report you have will greatly influence the cash for diamond's price. The most famous and most trusted of all certificates that all jewelers commonly respect is the GIA certificate. Within a diamond's certificate you will have the complete details of the diamond down to all the aforementioned details and then some. A certificate, however, will not wholly determine the cash for diamond you can get. It is not the same as an appraisal and does not include a monetary value for your stone. So there you have it, the 5 C's of diamonds. Arming yourself with his knowledge is vital when it comes to making the most cash for diamonds within the NYC area. Why are colored diamonds generally worth less than white diamonds?